A Different National Anthem, Before The Nation Was Ready For It : Code Switch "I did it to show my appreciation to America ... I love this country." Jose Feliciano, on singing the national anthem his way. His performance at the 1968 World Series sparked a national controversy. 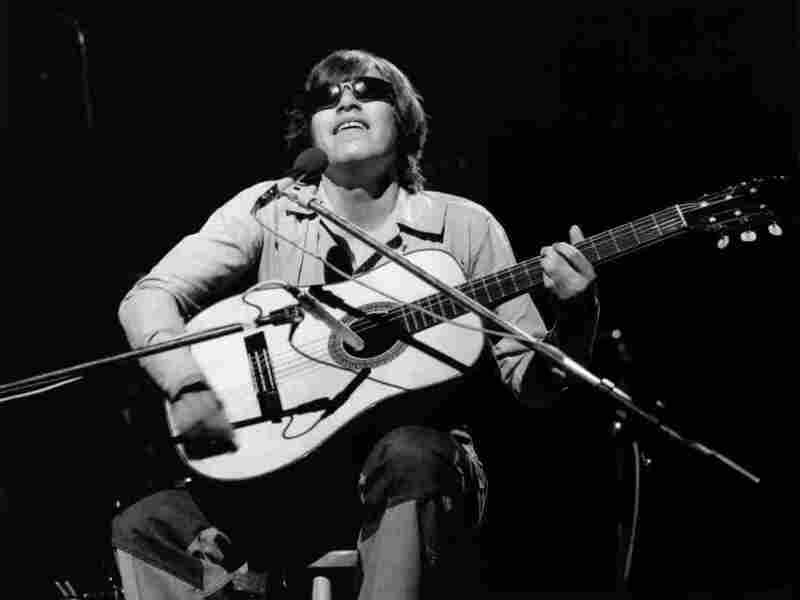 Back in 1968, a rising Puerto Rican pop star, José Feliciano, was asked to sing at Game 5 of the World Series. In 1968, a rising Puerto Rican pop star, José Feliciano, was asked to sing the anthem before Game 5 of the World Series. The St. Louis Cardinals were playing the Detroit Tigers in Tiger Stadium. At that time, Feliciano's had a hit single with his cover of The Doors' Light My Fire. The world seemed to be changing very quickly; there was a lot of focus on what media was calling the Youth Movement. It was a good time to showcase new talent. Vintage tape shows a young guy in sunglasses (Feliciano was born blind) seated on a stool, playing his acoustic guitar. Back then, the anthem was generally performed by popular musicians of stage and screen, or talented first-responders and members of the military, always in a very straightforward way. Feliciano's gentle, Latin jazz-infused version puzzled some people. And it outraged others. "After I sang it, it was really strange to hear me being booed, as well as yay'd, and I didn't know what happened," he recalled when I reached him by telephone last week, while he was on tour in London. A Tigers official told him the club's phones were lighting up with angry calls from around the country: "Some veterans were taking off their shoes and throwing them at their television screens," he was told. While some fans enjoyed this different version, many older ones and veterans thought it was disrespectful. At a time when the U.S. was torn apart apart over the country's involvement in Vietnam, perception counted. And some people perceived Feliciano's anthem as a protest. He insists it was the exact opposite: "I did it to show my appreciation to America for what they had done for me. I love this country." "They just stopped playing me .... "
Feliciano moved from Puerto Rico to New York City when he was a very little boy, and had grown up immersed in mainland American ritual — like Major League Baseball and the national anthem. "I thought they were singing about me," he jokes, "because they were singing 'Oh José, Can You See...'"
Soon he was singing back to America. His Light My Fire burned up the charts, and its success led to the invitation to sing at the World Series. The subsequent controversy, though, almost killed his burgeoning career. Commercial radio blackballed him. "I was a little depressed, to tell you the truth," Feliciano admits. His career had just taken off — "And then they stopped playing me. Like I had the plague, or something." Feliciano is philosophical about the evolution. "The only thing I can say about all these versions is they wouldn't have done it if I hadn't done it — and I'm glad that I did." And now, the national anthem is in the news again, as some NFL players protest police brutality against black Americans by remaining silent and kneeling during the anthem. Former San Francisco 49er Colin Kaepernick began the protest last season, but it has picked up this year, and spread beyond the NFL to college and even high school teams. Unlike some NFL fans, Feliciano says he's not offended. "I don't think kneeling during the anthem is such a bad thing. They're doing what they feel." Which is exactly what he was doing when he sang the anthem the first time. He's been invited to sing it several times since his initial performance in 1968. And he still sings it his way.